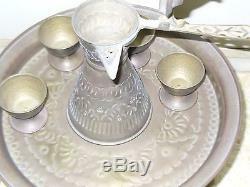 Vintage handmade brass coffee & cake service set made in Israel by Palestinian Bedouins in the 1950's. 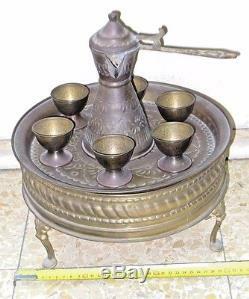 It consist of the upper level of of a coffee jar and 6 cups with their ceramic cups(I will join n the ceramic cups), then there is the lower level conpartement to store the sweet arabian cake served to visitors while drinking the bitter Bedouin coffee. 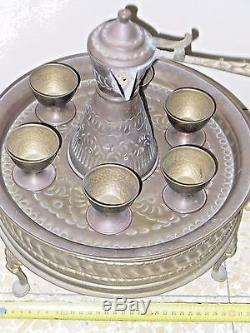 Dimension diameter 31 cm X 17 cm approximately. Please check the regulations in your country prior to purchasing the item. Please feel free to ask any questions. I'll reply to all emails. Customer service is very important to me. 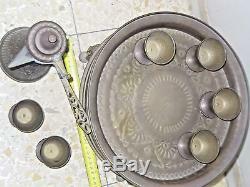 The item "COFFEE & CAKE SERVICE SET VINTAGE HANDMADE BRASS PALESTINE BEDUIN 1950's" is in sale since Monday, August 6, 2018. 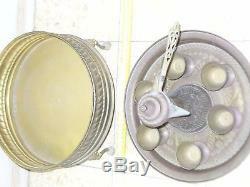 This item is in the category "Antiques\Asian Antiques\Middle East". 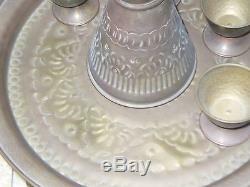 The seller is "benkish5" and is located in Jerusalem, default. This item can be shipped worldwide.